Asian Americans for Equality (AAFE) is a nonprofit organization dedicated to enriching the lives of Asian Americans and all those in need. The Youth & Family Team at AAFE is building the leadership and power of low-income youth of color and their families by developing politically conscious leaders who are active members of their communities, dedicated to social justice and equity through a network of leadership programming, community engagements, and meaningful relationships. 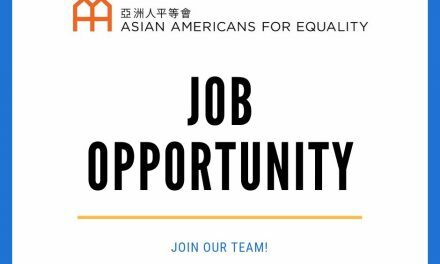 AAFE seeks a full-time Youth Organizer to work within the Youth & Family Team in Flushing, Queens. The ideal candidate is a self-starter, comfortable working in a close-knit team-oriented setting, open to self-reflection and feedback, practices curiosity, and is able to learn through doing. This staff member will work directly with youth living and learning in Flushing. Under the direct supervision of the Program Manager, the Youth Organizer is responsible for the activities described below. Create and facilitate a strengths-based curriculum for an after school youth leadership program, focused on identity development, social justice, and skills-based workshops. Support a group of 50 racially and ethnically diverse program youth in 9th and 10th grade through relationship building and general supportive counseling on topics including academic, personal, and interpersonal. Create Individual Participant Plans (IPPs) with each program participant, collecting information about student goals and support systems and monitoring student progress throughout the year. Contact parents as needed and work with Youth & Family team to increase parent engagement. Collect and analyze program participant and activity data, for the purpose of monitoring, reporting, and refining metrics for program outcomes and impact. Research case studies and identify best practices for youth engagement and leadership development in the context of community development. Develop and implement community service projects that educate and empower youth to organize community members to advocate for neighborhood services and investment, in partnership with local and citywide organizations. Report on program outcomes achieved and suggest and implement changes as needed. Support Youth & Family Team programming as assigned, including but not limited to college visits, Career Conference, Summer Retreat, celebrations, parties, special events, etc. Assist Program Manager in preparing regular reports. Participate in department and staff meetings and training. Share light chores to maintain the optimize organization and neatness in the office. Support office operation as needed. Bachelor’s degree in education, social work, psychology or another related field. Compensation is commensurate with experience. Excellent health and PTO benefits. Pre-tax deduction for retirement and Metrocard. AAFE and its affiliates are Equal Opportunity Employers.